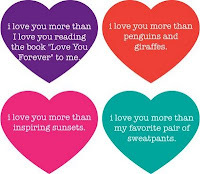 Cheryl pointed me to the "I Love you more than" website - it's fun! I love you more than watching what I like on TV. I love you more than getting my own way. I love you more than a clean house. I love you more than sleeping in. I love you more than dark chocolate . . . with roasted pecans. . . . ok, maybe not with the pecans. I've also got to tell you that I love the book Hate That Cat by Sharon Creech. It's the sequel to Love that Dog, and it's great. I'm listening to it in the car, and I actually laughed out loud on the ride to work today (even though my toes were froze) It's written mostly in poems, or at least that is how the reader is reading it. Lurve it! I am all about the warm. Might even want some hot right now. Anything but all this cold.